DEAD 2048 is a new, super cute and unique game from Cogoo Inc’s Play Studio for Android devices , which has been released for free on Google Play and has been downloaded by around 5,000 times by Android users around the world for the time being and, as always, for We have introduced it to you in the first time ! Dead 2048 is a combination of two different genres, the first genre, survival and survival, and the second genre is a mystery! 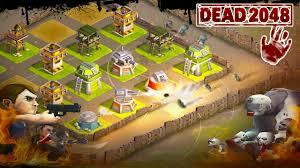 In the DEAD 2048 game you start at the base, or the Safe House area, with small parts of a military base, first creating a skeleton of a simple building, and then building it together with another skeleton. And from the combination of houses to larger centers, as well as the process continues to larger sections so you can eliminate zombies.